Health Promotion in Midwifery explores the principles of health promotion within the practical context of midwifery. 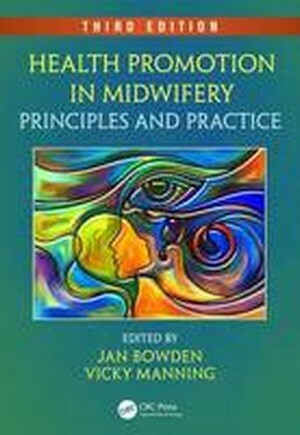 It clearly outlines and discusses the midwife’s role in health promotion, linking theory and practice. The third edition of this evidence-based text covers essential topics such as breastfeeding, smoking, mental health, behaviour change and sexual health promotion and includes new chapters on healthy eating in pregnancy, pelvic floor health during the childbearing years and violence against women. All the chapters are updated and some are completely rewritten to reflect recent changes and developments in midwifery practice. Text boxes make the text accessible and user-friendly, and case studies and summaries put the material in practical context. Additional readings encourage readers to further research and reflection on their own practice. This textbook is essential reading for midwives and health visitors in education and practice. Public Health, Midwifery and Government Policy. Health Promotion and the Midwife. Health Promotion and Models in Midwifery Practice. Evaluating Health Promotion Activities. Attitudes, Values and Behaviors. Women and Health Promotion. The Role of Complementary and Alternative Medicines in Health Promotion. Promoting Good Health in the Postnatal Period. Childbearing, Healthy Eating and Exercise. Breastfeeding. Smoking Cessation. The Challenges of Mental Health Promotion. Sexual Health Promotion in Midwifery Practice. Abused Women and Health Promotion. Communicating Health. Partnership Working and the Midwife. Jan Bowden is the Midwifery Programme Lead at King’s College London, UK. Vicky Manning is a Midwifery Lecturer at King’s College London, UK.